The popular minister of the famous Kashmiri King Avanti Varman, Hakeem Suyya, is still remembered everywhere as a Messiah who saved Kashmir from the ravages of flooded Jhelum and prevented famines. His story used to be in the history books prescribed in Schools in forties and fifties. One does not know if the feat of this famous and popular man is still in the present school text books. However, there is an everlasting tribute to him in the name of the town Sopore which is a later version of the original Suyya Pur, town established by the able minister. The story about Suyya in Kashmiri Pandit Network website is given as, “Once the country was in the cruel clutches of a great monster-famine. Everybody was grieved. The king was helpless and no plan could be devised to mitigate the suffering.But then God sent an angel in the form of a man Suyya. His birth was unknown. When a baby he had been left in an earthen pot covered with a lid which a Candala woman picked up while sweeping. Her name was Suyya. She gave it to a Sudra for rearing up. The baby grew up into an intelligent boy and acquired some education. He became a teacher. He was generally surrounded by a crowd of sensible men. When the people complained of Famine, he told them that he could get rid of this monster provided he had the means. The king summoned him but he didn’t reveal his scheme. The people thought him mad but the king kept the treasury at his disposal. Suyya took many pots, full of money, in a boat and went towards Madavarajya, the southern district of the valley. He threw some of money at a village called Nandaka (Nandi on the Veshan river), meaning the place of money', which was submerged with flood water and then quickly came back. Then he went to Yakshadara (Dyara-gul, meaningthe place of money’, near Khadanyar below Baramulla) and threw lot of money into the river. Everyone except the king thought that he had gone crazy. But the famished people who had watched Suyya throwing money in the water, immediately jumped into the river to find the coins and thereby clear the bed of rocks which had rolled down from the hill side and blocked the river. Consequently the water flowed down.Previously the Jhelum and the Sindh met near Trigam turning large areas into a swamp. But Suyya regulated the course of the river so that the water flowed right into the Wular Lake. The tributaries also were directed usefully. Suyya had many villages reclaimed by having circular embankments raised all round them to keep out the water so that they looked like round bowls (kunda). As a result of these projects hundreds of villages were reclaimed and crop grew unprecedentedly. One kharwar of paddy which used to sell for 200 dinars in prosperous times-now was sold for 36 dinars.Suyya built the present town of Sopur on the bank of the river Jhelum in his name. He prohibited killing offish and water-fowl in the Wular Lake. He granted the village Suyya a Kundala to the Brahmins in honour of his mother Suyya and constructed the bund Suyya-setir after her name”. Well, we may not find a Suyya in present times but one could follow his example to save the population from the ravages of the flood. One does not have to go with bagful of gold coins and throw in the River to dredge it. There are more sophisticated means available now which could be bought against the present gold coins! Unfortunately, the expenders of the gold coins want to keep some for themselves which slows down dredging and strengthening of embankments. There is a way to follow Suyya’s example! People need lot of sand and earth for construction which is going at a breakneck speed all over the valley. The government has only to announce that people in need of sand and earth can take it free on their own from the River and the flood channel. Only areas and depths to which they can go have to be demarcated. Dredging and removal of sand will take place at break-neck speed. However, the embankments would need to be strengthened. Even this work can be done by the people on their own. One wonders why the leaders of the “Popular Movement” are not stepping in and starting something like Mahatma Gandhi’s Salt and Khadi movement.They could motivate people to work out wonders on the environmental front including the salvaging of fast disappearing water bodies. If the people start such works on their own the government would have no justification to stop these and would rather be put in an embarrassing situation. This may force them to take to initiate all requisite technical steps at an accelerated pace. 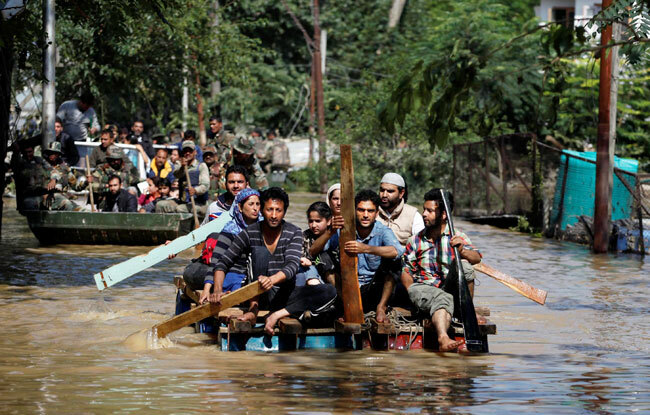 In any case, there are no two opinions that unless fool-proof flood prevention measures are taken on a war footing, Kashmir may be in for another disaster soon. Even God Almighty may not help us at that time because of our refusal to learn from our past mistakes!